This event doesn't take skill... just blind RNG luck. Wouldn't be surprised if there's a RNG calc that looks at your total spend in game too (I'm FTP), considering how many g8-g11 vids I've seen on YouTube of streamers only needing 30 or so attempts with my exact squad. To make matters worse, there aren't even individual character packs to buy to boost individual characters... cuz at this point I'd drop a $100 if I new I could take one of the new BHs to 7*. Instead just a single measly pack for 25 to 50ish shards for all BHs. What a missed opportunity, CG. The only legendary aspect of this event, is how terrible its designed. Your Speed/CC/CD are good, but how's your Potency? If you're having survivability issues, BF's leadership makes a squad-wide investment in it most worthwhile. 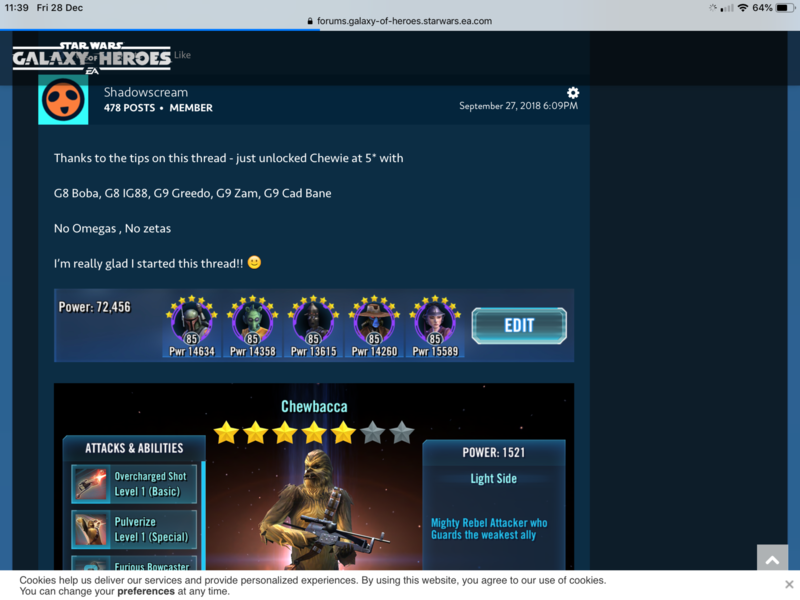 Can you link your swgoh.gg so we can see your mods and try help you? 1) You know that you can’t AOE right? 2) Are you running IG88? — he’s a liability but if so, see point 1 and avoid Rapid Fire. Can't link my stuff cuz I work a 14 day rotational schedule and that site is blocked at work. But I had Potency mods set on IG, Cad, and Greedo... 75%+ on all of them. BF and Dengar with crit c/d sets. Never been AOEing either. This event just wasn't meant for OG characters. Folks who say otherwise just don't realize how lucky their RNG was. "i DiD iT wItH a LoT wEaKeR SqUaD tHaN yOuRs"... lol congrats bro. I don't doubt that with RNGesus on your side it can be done, but when you need RNG to line up to survive the initial onslaught, stealth Dengar, prevent stuns, prevent ability blocks, do max crit damage with each character yourself, proc chain hits with Greedo, and survive the second round of hits just to stand a chance of taking down Chewie, your talking about 1/1000s likelihood to have all those happen at once. Sure there will be people that have that happen in their first few attempts. Majority wont though. Comments on forums and videos seem to confirm this. There's nothing skillful about that and it doesn't reward players who've taken time to actually gear up. It's just blind, dumb RNG luck for OG teams and the odds have not been in my favor. I'll just have to farm Bossk and JF and try again in the summer. Is RNG a tactic though? Blaming ineptitude on RNG seems to be a theme - that or accusing others who have posted numerous guides/tips on how to do this event of being “lucky/lying”. Here’s what I used for 5* Unlock (20 attempts) -> First Chewie event. For the 5* unlock I really struggled with that squad power and no Dengar - but I came to the forums asked for help —> I assumed that “I was doing something wrong” rather than raging about difficulty. I got helpful tips - I remodded, avoided AOEs and changed my kill order. I carefully read ROLOs leadership and other abilities and I got it done with that team. I got further advice from players here that run Thermal Detonator Boba lead teams and I geared up my lineup and farmed Dengar. I knew from how trivial TB, Rebel Roundup and Galactic Bounties had become that my lineup was much stronger. Once I heard they had fixed the TDetonator bug I knew that my team would be fine. No one died on ANY of my 3 restarts - Dengar stealthed, then I controlled the fight - used my stuns, avoided AOEs. = 7* Chewie. I can accept that maybe I was a bit lucky, but seriously there’s ZERO way anyone should be taking 100s of attempts if they are setup correctly. Several of the more vocal complainers on here have been busted as either running the wrong mods, no mods, using IG88 (and i suspect AOEing and feeding TM to the enemy team). By all means ask for advice, by all means be self critical but the first step in any problem is admitting you have one! This event was never designed to be easy. I'm sure I had a lot of luck on my side, but I beat it in 3 tries. Still had Boba, Bossk and Dengar standing. RNG plays a role, but your moves can effect it too. Keep trying different moves and you will figure it out. ZBossk G12 (lead, ZBoba G12, Greedo G10 (one away from 11), ZamG11, Dengar G11. All but Dengar and Greedo had 200+ speed. Quit your whining man, of course there is skill to it as well as RNG. It took me lots of tries, each of which I learnt from. Love all the salt from you RNG lottery winners. Grats on your rolls. Without Bossk and only having IG is just straight RNG and believing otherwise is foolish. It's clearly on me though not having them, as I've been prioritizing farming TOR characters so I can get Revan. My beef is the false advertisement, as this is not a BH event... it's a Bossk and/or P2P BH event unless you win the RNG lottery. That's a fair burn. I wont deny I've been angrily sitting on the toilet more than usual trying to win my 7* Chewie during bathroom breaks. : D That's a fact! Not admitting that a BF, Cad, Dengar, Greedo, IG team requires pure RNG though is just inaccurate. Haha. Im at least 12 months away from having Ewoks ready for that! Probably longer. I'll have to stay active on here so my raging seems more justified in the future... see you on the boards! You're using Greedo AND Ig88 - both who fall over in a light breeze. Against an opponent where 4/5 of them have AoEs. Of course you're going to struggle. It CAN be done, but it's definitely the hard road. I only got chewie 5* when it came out. I worked on BH after that. I got 7* this time. It's about priorities. You chose to farm Revan toons, I chose to farm BH. You may miss Chewie. I may miss Revan. That's the way the cookie crumbles (unless you $$$). So I'm man enough to admit when I'm being a stanky s.o.b. and today is one of those days. I was wrong. You bros were right. Grats! Nice to see someone listen to good advice and get rewarded for it. Grats though, he makes.... something better lol. Rng is a very predominant part of.. ahem, can't even call this a game. You should acknowledge your bad planning, but don't just completely rule out the awful event mechanics. That would just be empowering the misinformed. I got him at 6* the first time around with an hour to spare with a 6* Bossk, I knew from the unbelievable difficulty 7* was gonna take max gear and mods. Lucky I was able farm Bossk and Embo, both free farms in time to compete in the event, saved me a lot of stress - glad to hear you finally got 7* Even tho I was able to star Them The gear was my problem, had to spend 30,000 TB credits to gear everyone up with insane health and Protection to withstand the initial onslaught! Then after reading peoples experiences with kill order I got him, it was worth it!